At last week’s summit with South Korea’s President Moon Jae-in, Kim promised to allow outside inspections on key missile facilities, and expressed a willingness, for the first time, to “permanently” scrap North Korea’s main nuclear complex. While these are positive first steps, experts say they would do little to damage the country’s larger nuclear and missile capabilities, nor demonstrate whether Kim is serious about giving up his nuclear arsenal. 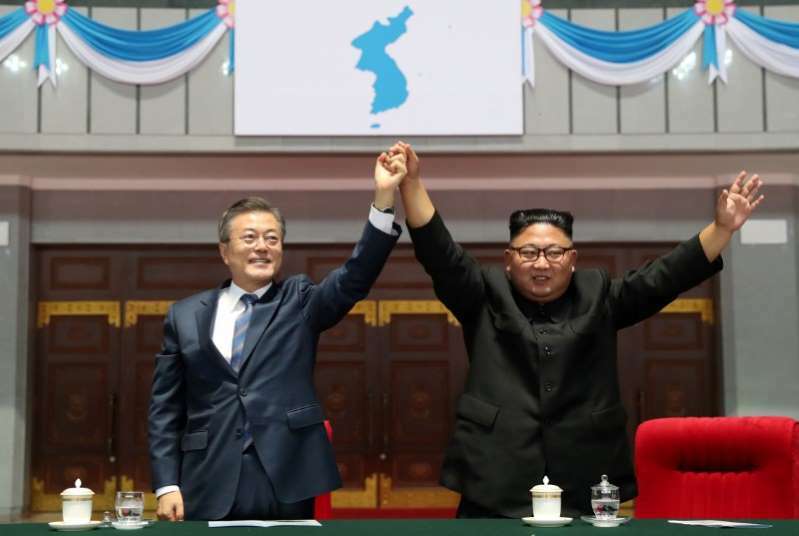 The agreement by Kim and Moon also does not stipulate any plans by North Korea to declare a list of its nuclear weapons, facilities and materials, or a concrete timeline for denuclearization. With U.S. Secretary of State Mike Pompeo expected to meet his North Korean counterpart Ri Yong Ho to restart nuclear talks as soon as this week on the sidelines of the U.N. General Assembly, here is a summary of Pyongyang’s nuclear and missile capabilities at stake. In the joint statement, the North expressed its willingness to “permanently dismantle” the Yongbyon nuclear complex if the United States takes corresponding action. Moon said this would include a declaration of an official end to the 1950-53 Korean War. A sprawling complex located about 100 km (60 miles) north of the capital, Yongbyon is the country’s main nuclear facility and the birthplace of its nuclear programs. Built in the late 1950s with Soviet aid, it houses at least three reactors, fissile materials, fuel re-processing plants and a multitude of research labs, according to the Nuclear Threat Initiative (NTI), a Washington-based think tank. An operational five-megawatt reactor there produces weapons-grade plutonium, while there is also a facility to produce highly enriched uranium (HEU), also used to make atomic bombs, experts say. Dismantling Yongbyon would slow the production of fissile material, but not reduce the current stockpile of plutonium and HEU, nor clear suspicions of other secret production sites, says Joshua Pollack, a North Korea missile expert at the Middlebury Institute of International Studies in California. “Yongbyon is where all of North Korea’s plutonium production has taken place, so this step would effectively cap their stockpile of plutonium,” Pollack said. North Korea has denied the existence of other secret sites, but U.S. media reports, citing intelligence sources, said in recent months the North has been running at least one covert uranium enrichment facility just outside of Pyongyang, known as the Kangson enrichment site. “But there is still value in being able to verifiably shut down the known facilities with a negotiated mechanism for inspecting suspected sites,” said Jenny Town, managing editor of the Washington-based Stimson Centre’s 38 North project, which provides satellite imagery analyses of the North’s weapons facilities. North Korea also said it will “permanently dismantle” its missile engine testing site and launch platform in the northwestern town of Tongchang-ri in the presence of experts from “concerned countries”. Also known as the Sohae satellite launching station, this site has been the country’s primary site for rocket launches since 2012. It is where the North last year test-fired intercontinental ballistic missiles (ICBM) designed to reach the U.S. mainland. The facility consists of a missile assembly building, a launch pad with a gantry and mobile launch platform, fuel and oxidizer storage, a rocket engine test stand and an instrumentation stand, according to NTI. In July, after the Singapore summit between Kim and Trump, satellite imagery indicated the North has begun dismantling the engine test site in Tongchang-ri, but without allowing outsiders access for verification. While it has served as a key test center for liquid fuel engines designed for long-range missiles and played an important role in the country’s ICBM development, Sohae’s importance may be diminishing, experts say. Pyongyang, having declared its newest ICBM complete in November, has called for mass production to begin. The North has also been moving toward solid-fuel missiles that can be fired from harder-to-detect mobile launchers, making a fixed stand increasingly unnecessary. There is also at least one other operational missile launch station, Tonghae or Musudan-ri in the northeast, though it has not been used since 2009. Estimates on how many nuclear weapons North Korea vary. U.S. intelligence officials have put it at between 30 and 60 warheads, while South Korea’s intelligence agency said last month the North may have as many as 100 warheads. 38 North, which estimates North Korea has 50-60 nuclear warheads, said last year the operational Yongbyon reactor is capable of producing around 6 kg of plutonium every year, enough to make about two bombs. The suspected continuation of production makes it an urgent task to get Pyongyang to first freeze nuclear and missile production, as well as convince it to declare all related facilities for verification, experts say. “How far the North would go to disclose its facilities would be key,” said Kim Dae-young, a military analyst at the Korea Research Institute for National Strategy in Seoul.